Cute little folded enclosure care for baby shower gift. 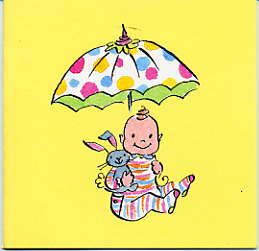 Yellow background with cute baby in striped outfit with stuffed bunny under a polka dot umbrella. Art by Lulu illustrator Anne Keenan Higgins. NOTE: Only 8 left!